Baldwin Hardware has a rich heritage of delivering modern luxury to discriminating homeowners. Baldwin Prestige Series offers effortless, accessible style and luxury. With the Baldwin Prestige Series, any homeowner can instantly create an atmosphere of confidence from the moment someone knocks on the door. Baldwin Prestige Series is affordable luxury. The Baldwin Prestige Madrina Lever features a rustic inspired design which is offered in keyed-entry, passage, privacy, and half dummy functions. Welcome Home Series<sup></sup> handlesets are the perfect addition to your front door to create a unique and fashionable entryway to your home. Each is stylishly designed to provide maximum-security protection. There are many styles, finishes and configurations from which to choose. The straight styling of the Aspen lever creates an elegant, contemporary feel This half-dummy, or trim function, is surface mounted on doors where only a pull is required. The Venetian Bronze finish is hand-rubbed to reveal unique bronze highlights and provides a rich and warm complement to the product's style. Collections by Weiser offers five handlesets to choose from. These handlesets offer solid forged brass construction and Grade 1 cylinders for uncompromised security. With a touch of the coast, Avalon's sweeping curves provide a heightened sense of style. This half-dummy, or trim function, is surface mounted on doors where only a pull is required. The distressed and rich tones of Rustic Petwer add the finishing touch to this product. Elements by Weiser® provides an expanded choice styles and finishes at an affordable price. The smooth simple lines of the Belmont lever and wave style design is an attractive addition to any home. This passage lever is best used on interior hall and closet applications where no locking is required. The lever is reversible and mounts on both left and right handed doors. The Venetian Bronze finish is hand-rubbed to reveal unique bronze highlights and provides a rich and warm complement to the Belmont's style. Prestige Madrina Venetian Bronze Right-Handed Dummy Door Lever Baldwin Hardware has a rich heritage of delivering modern luxury to discriminating homeowners. Baldwin Prestige Series offers effortless, accessible style and luxury. With the Baldwin Prestige Series, any homeowner can instantly create an atmosphere of confidence from the moment someone knocks on the door. Baldwin Prestige Series is affordable luxury. 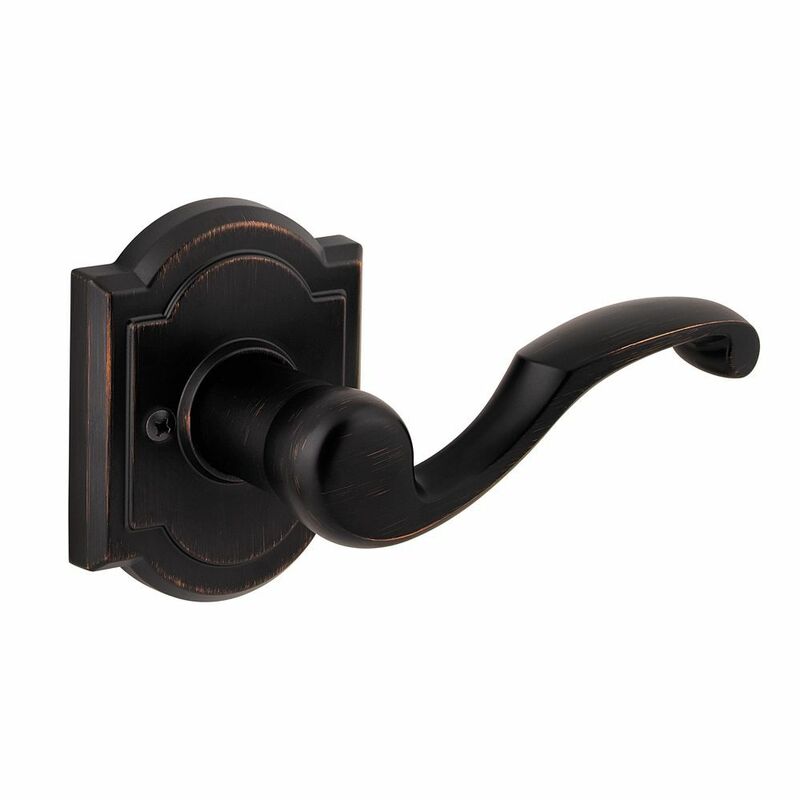 The Baldwin Prestige Madrina Lever features a rustic inspired design which is offered in keyed-entry, passage, privacy, and half dummy functions. Prestige Madrina Venetian Bronze Right-Handed Dummy Door Lever is rated 4.2 out of 5 by 5. Rated 5 out of 5 by Dp from BEST!!! Quality is all there 100% 26 doors in our house and only have the Prestige Madrina Venetian Bronze handles on our new soild doors! They made the new doors complete! Rated 4 out of 5 by EDIY from Really nice looking handles if you can find them. These are very nice handles and will absolutely make an average closet door look more expensive and classy. They are pretty solid and well made and for the price are worth paying a bit more than the average ho-hum looking standard brass closet door handle. The installation is a piece of cake (MAKE SURE NOT TO ORDER DOORS WITH A BORED HANDLE HOLE!) and the handles are fairly sturdy themselves. However, I do notice that they tend to wobble a bit after a few months of use. The finish is nice, although I'd prefer that they were solid dark bronze in color as I am not a fan of the little 'scratches' that show copper as accents. Be sure to get the matching aged brass/bronze ball latches to make the look uniform. The only thing I noticed is that very few stores near me had these. I found 3 at my local store but had to drive 20 miles to get the other 3 that I needed. My store said they usually dont carry as many of these as the working handles. The other 2 nearby stores did not even carry this series of handle. One tip ... I hang these upside down. I find that they look better that way and also the little indentation facing down means you can easily hang a shirt hanger or drape a tie or belt over the handle and have it stay. It might sound weird but it doesn't take any more/less work to hang them upside down. Rated 4 out of 5 by adams from Great quality, one minor pitfall Overall, I really like this product. The quality is solid, it's easy to understand how to install it, etc. One thing that you should take into consideration is that if you're installing door handles with non-circular frame (the part that the handle connects to that hides the hole in the door), you have to get the handle just right so it's level & parallel to the door. Otherwise, the handle will look slightly crooked. It's not a huge deal, and isn't anything wrong with this product in particular, but just something to be aware of when selecting hardware. Rated 5 out of 5 by jenirose3 from Love these!! We love the look of these. We put these on a pair of office doors. One thing we didn't know was that you will need a pair of left and a pair of right when installing on office doors or other doors where you see both sides. On pull out closet doors you may only need one of each. I ended up running back to HD because I didn't have a pair for the other side.